Historical Segeltjalk, outside largely original condition and sailable! Used by 2013 as a charter yacht with up to 12 passengers successfully on the IJsselmeer and the Wadden Sea. The conversion to the barracks ship was started and not finished. Opinion on the thickness of the hull from 2013 exists. Exclusive offer at Michael Schmidt & partner. Central agent! Detailed questions are welcome. Please contact us, we have visited this yacht for you. This boat is a rare original copy. It was built in 1936 in the Lübeck Staackwerft by the boat Builder Sande by hand. in 1937, it has won a gold medal for the German motor boat construction. At that time, it was built for a "well-heeled" industrialist and since bears the name "CONDOR". The track lost first, the boat was found in a barn, where it was waiting for its restoration. 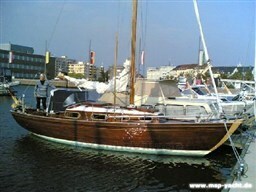 The current owner has discovered it at a small port of Elbe, purchased and brought to the reconstruction. All parts are still in the original and had to be restored also tedious. The boat was in very poor condition and had to be rebuilt from the ground up. The owner has opted for the retention of the classic looks and supplemented with modern boat building and diesel technology. Therefore, the future owner has a safe and technically up to date (Constance approval) restored boat. In every port or on the water this boat will be always an "eye-catcher". The rest of mahogany consists of oak, the underwater hull. The total length is 7, 50m and the width 1, 40 m. These unusual dimensions are rare, and give the body a special dress and aesthetics. The boat with a new Volvo diesel engine with 75 HP with a Constance approval. Original machines are no longer available or restaurieren capable. This is among other things to the required gear, which must be suitable for a wave system. For future use, a special focus was placed on safety and reliability. Sails very well and safely! Engine complete overhaul 100 operating hours Extensive restoration in 2015! 2017 now with furling Genoa and 'new' steering wheel. A gem among the yachts! This beautiful yacht is a construction of the famous Scots A. Balfour. It was produced in 1965 as German license shipyard construction. The expert restoration devoured more than €100.000 and was recently completed. Then just little sailed the yacht due to time constraints. The "Princess la mer" is a stylish, safe and sea-cruising yacht, with excellent sailing properties. It has a cozy cabin in height with an elegant interior, galley and separated fore cabin with toilet area. It is a beautiful yacht design of the famous Scot A. Balfour. It of what produced as a German license shipyard construction 1965. The expert restoration devoured well over 100,000, - € and has recently been completed. Then the yacht for reasons of time, little what sailed. The "Princess la mer" is a stylish, safe and seaworthy cruising yacht, with excellent sailing characteristics. It has a cozy cabin at standing height with elegant interiors, galley and forecastle with separated toilet area. Petroleum raised number of burners 2, washer sink unit, cooler, pressure cold Anchor, anchor chain zinc-plated length 25, anchor locker, electric bilge pump, mechanical bilge pump, propeller number of blades 3 Batteries number 2 total Ah 150 lead, on-board power supply 12V, shore power 220V, battery charger, 12V socket, socket 220V Pushpit, pulpit, guard rails, guard rail with rail gate, fire extinguisher, navigation lights, lifebelts, signal horn Main sail Dacron Madera 30 qm, Genoa I Madera Dacron 15 sqm, Head Sail Madera Dacron 10 sqm, Storm head sail Madera Dacron Mast wood, timber boom, spinnaker pole wood, spinnaker set up Sloop top Boom full cover, cockpit awning, enclosure, winter cover Radio, CD-player, cockpit table, fenders / mooring line, Fender holder, cockpit speaker A gem among the yachts! This beautiful yacht is a construction of the famous Scots A. Balfour. It was produced in 1965 as German license shipyard construction. The expert restoration devoured more than €100.000 and was recently completed. Then just little sailed the yacht due to time constraints. The "Princess la mer" is a stylish, safe and sea-cruising yacht, with excellent sailing properties. It has a cozy cabin in height with an elegant interior, galley and separated fore cabin with toilet area. It is a beautiful yacht design of the famous Scot A. Balfour. It of what produced as a German license shipyard construction 1965. The expert restoration devoured well over 100,000, - € and has recently been completed. Then the yacht for reasons of time, little what sailed. The "Princess la mer" is a stylish, safe and seaworthy cruising yacht, with excellent sailing characteristics. It has a cozy cabin at standing height with elegant interiors, galley and forecastle with separated toilet area.